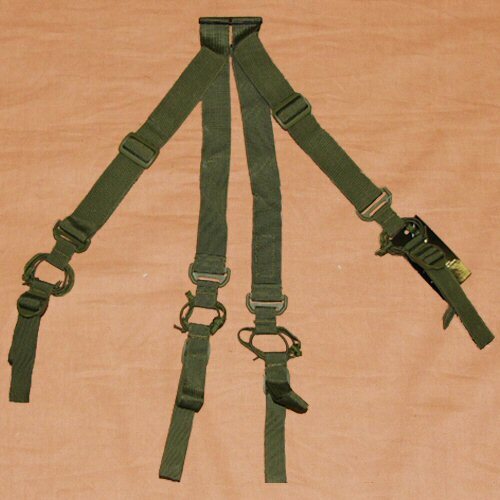 The Bulle tactical shoulder harness is designed for use with duty or trouser belts in general. It is an excellent combination with the US Bulle duty belt. The tactical shoulder harness is a highly adjustable shoulder strap system which helps to relieve pressure on the hips when the duty belt is being worn with a full tactical load complete with subloads. Generously sized and adjusted belt loops are provided at four points: front left, front right, rear left, rear right. These have an integrated patch of hooked (rough) velcro sewn in to match with the (smooth) looped velcro which is found on the inside of the US Bulle duty belt to prevent slipping. Each of these loops is fitted with a high strength UTX-Flex slide adjuster which is designed for military and tactical use. The shoulder straps themselves are made of 40mm Cordura webbing which helps to spread the weight of the load being supported. These are adjusted via high-strength large UTX-Flex slide adjusters. To enable free movement and stretch where necessary, each point is elasticated with doubled elastic shock cord and a fail-safe nylon cord. The left and right shoulder straps are threaded through a tough, adjustable YKK strap unifier which is designed for use on protective military and firefighters' oversuits. The shoulder harness is lightweight overall, adding very little profile whilst enabling a fully loaded belt kit to be carried with ease and in comfort. They can also double up as trouser braces when fed through a trouser belt. This is the olive shoulder harness. Any accessories shown are for illustration purposes and are not included with the harness.